A blend of doe urine and natural authentic Tonquin musk. Tonquin musk is highly attractive to all whitetail deer. It is a sexual stimulant to a buck during the mating season. While evaporating slowly it will give off scent for longer periods of time. 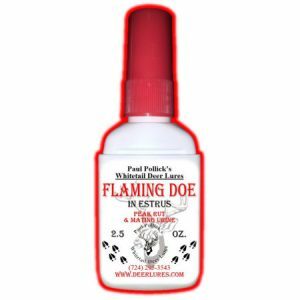 This product will draw a strong response the entire hunting season. I used your Doe Urine w/ Tonquin and I won’t hunt without it. Works all season! I used it as a cover trail but found it a great attractor as well. Hi Paul, I use your interdigital with great success. This season I decided to try the doe urine with tonquin musk. I was greatly surprised! 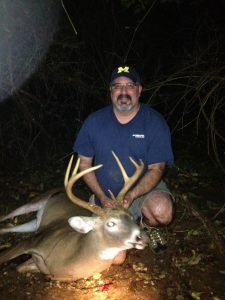 3 weeks ago, I pulled in a doe 60 yards down wind of my stand. That doe came within 10 feet of my stand and scent checked for 5 minutes. 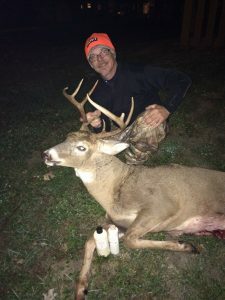 Last night (10/12) I shot this 8 pointer (picture attached). A 5 pointer was ahead of the 8 and seemed cautious. But the 8 couldnt help himself and had to check it out. Seems buck and doe alike are really attracted to it. And to think its only the beginning of the season. Its great to finally use scent that consistently works!